The Easiest Way to Buy Mexican Auto Insurance! Driving to Mexico? 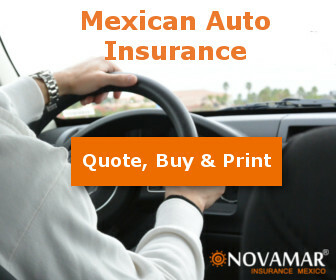 Let Novamar Insurance take care of your Mexican auto insurance needs. Our easy to use website allows you to buy and print out your policy before you go, so you don't have to stop at the border. We offer some of the most comprehensive coverage available at competitive rates. Under Mexican law, motorists are required to have insurance, or "proof of financial responsibility", in the event of an accident, even if you did not cause it. As a foreigner traveling in Mexico, the only way of demonstrating this financial responsibility is to have sufficient real currency to cover damages, or an insurance policy from a Mexican insurance company. U.S. insurance or any other non-Mexican insurance does not cover your liability for potential accidents, nor does it fulfill the basic requirement for insurance according to Mexican law. Does My U.S. Insurance Policy Cover Me into Mexico? Your U.S. insurance policy may cover for physical damage or theft a certain number of miles into Mexico, but by law it cannot fulfill the legal requirement - a Mexican liability policy. We recommend calling your U.S. insurance company to ask what they cover and get it in writing. What Types of Vehicles Do You Cover?We offer coverage for cars, pickups, SUV's, vans, motorcycles, RVs, and towed items like trailers, boats, ATVs and campers.